Designed to beam broadband messages to smart phones from more than 22,000 miles in space, a massive spacecraft blasted off Sunday from the plains of Kazakhstan on a Proton rocket in the first phase of deploying a unique wireless communications network stretching across North America. The 11,900-pound satellite, named SkyTerra 1, will join traditional terrestrial cell networks to shape a fourth-generation, or 4G, wireless system designed to reach nearly every American by the end of 2016. The ambitious plan is a project of LightSquared, a Virginia-based firm with $2.9 billion in fresh financing from Harbinger Capital Partners of New York. LightSquared, which recently changed its name from SkyTerra, also claims another $1.75 billion in equity financing from other sources. Sunday's launch will allow LightSquared to meet its commitments to the Federal Communications Commission, the regulatory agency managing broadband communications spectra in the United States. The Proton rocket soared into starry skies from the Baikonur Cosmodrome at 1729 GMT (12:29 p.m. EST) on the blue-orange flame of six main engines. The three-stage booster seemed to work flawlessly and handed over to the Breeze M upper stage less than 10 minutes after liftoff. The Breeze M ignited a few minutes later to propel the payload into a stable parking orbit about 110 miles high, according to International Launch Services, the U.S.-based firm overseeing commercial Proton flights. Four more Breeze M burns were expected to reach an orbit stretching from a low point of 3,750 miles to a peak altitude of more than 22,200 miles. The planned inclination at spacecraft separation was 19 degrees, according to Khrunichev, the Proton rocket's prime contractor. ILS declared the launch a success in a statement released late Sunday after spacecraft separation. "It is very exciting for ILS to be a key partner for the launch of the SkyTerra 1 satellite for LightSquared, the new innovator for wireless broadband," said Frank McKenna, president of ILS. SkyTerra 1 will raise its orbit with an on-board liquid-fueled boost engine. The satellite will ultimately be positioned in geosynchronous orbit 22,300 miles above the equator at 101.3 degrees west longitude, in view of potential customers in the United States, Canada, Mexico and the Caribbean. "At LightSquared, our goal is to revolutionize wireless communications and our timeline to do that is very aggressive. We knew we could count on ILS and ILS Proton to help us maintain a steady pace with an on-time launch," said Sanjiv Ahuja, chairman and CEO of LightSquared. "The ILS Proton launch of the SkyTerra 1 satellite is an important step toward bringing mobile wireless services that are accessible anytime, anywhere, throughout the United States. We are grateful to the entire team of dedicated professionals who worked on the SkyTerra 1 launch." Another satellite, SkyTerra 2, will launch on a Proton rocket in 2011 to finish LightSquared's space segment. Both spacecraft are based on the Boeing 702HP bus platform. The company is also developing and installing a terrestrial network. 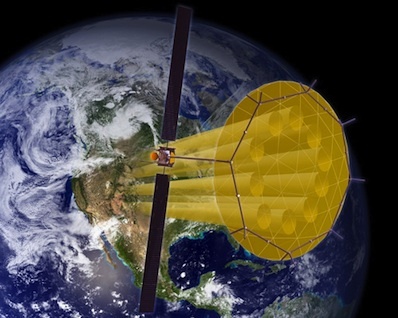 "What's so special about (LightSquared) is it will provide, for the very first time, mobile communications in North America anytime, anywhere, any place," said Steve O'Neill, president of Boeing Satellite Systems International Inc. "This service does not drop off and will cover both urban and rural areas because we can provide that capability from space." Boeing also developed four gateway ground stations to operate the SkyTerra satellites. "LightSquared is providing not just this mobile communication, but rather they are providing a public service," O'Neill said. The company says it will generate more than 100,000 direct and indirect private sector jobs through the construction and operation of the LightSquared network, realizing the FCC's wish of expanding the reach and reliability broadband services. "The best example of that would be what happened during Hurricane Katrina," O'Neill said. "Unfortunately, the National Guard had no ability to communicate because all the terrestrial systems were down. What this service will provide is the ability to have 20 times the capability to communicate for all first responders anywhere in North America." SkyTerra 1 will unfurl the largest commercial antenna reflector ever built, stretching 72 feet in diameter. The L-band reflector was built by Harris Corp. The spacecraft is designed to work for at least 15 years. Sunday's launch is the 10th Proton flight of 2010. One more commercial Proton rocket is scheduled for liftoff in December with the KA-SAT communications satellite for Eutelsat. A Russian government Proton is also expected to launch three Glonass navigation satellites next month.